In celebration of Scottish poet and writer Robert Burns’s Birthday (25th January), Burns Night takes place this week. Falling on Wednesday, a great number of Burns Night events are taking place across the week to celebrate. From Scottish-inspired set menus to whisky tastings and the occasional deep-fried Mars bar, here’s our pick of the best food and drink events to celebrate Burns Night in London. One of London’s best Scottish restaurants, Mac & Wild will host a whole week’s worth of events dedicated to Robert Burns. Beginning with a haggis-making masterclass this evening (23rd January), followed by a whisky and beer pairing event on Tuesday 24th January and whisky masterclass on Friday January 27th, a special Burns Set Menu will be available on Wednesday evening. The Burns Set Menu will include a suitably Scottish host to address the haggis, plus the option to pair each course with a specially paired whisky. What’s more, haggis, neeps and tatties are on the menu at both restaurants all week, as well as a Burns whisky flight and a Bobby Burns whisky cocktail. Mac & Wild’s Burns Set Menu is priced at £35 per-person. Further information can be found at macandwild.com. Available for dinner on 25th January, 108 Brasserie in Marylebone will offer a three-course set menu, created by Executive Chef Russell Ford to showcase a number of Scottish classics. Priced at £40 per-person, the menu will include the likes of Cullen Skink; traditional haggis, neeps and tatties with a whisky cream sauce; and the restaurant’s famous deep-fried Mars bar accompanied by honeycomb ice cream. In addition, the restaurant will offer a whisky pairing dinner (£60 per-person) with each of the three dishes matched with Scotch selected by expert David Miles. These include Macallan Sherry Oak 12 year-old, Bowmore Darkest 15 year-old and Highland Park 12 year-old. Tickets for the whisky pairing dinner can be ordered from eventbrite.co.uk. Plum + Spilt Milk at the Great Northern Hotel in the heart of King’s Cross, will also offer a set menu on Wednesday evening. Named after the dining livery of the famous Flying Scotsman train, the restaurant will serve a four-course menu devised by Chef Director Mark Sargeant, paired with Dalmore whiskies. Expect Arbroath Smokie with leek and whisky soup, paired with a take on an ‘Old Fashioned’ cocktail made with Dalmore 15 year-old; and a main course fillet of Mey Selections Highland beef with roast celeriac and wild mushrooms. In addition, traditional haggis, neeps and tatties will also be served, ceremonially piped in by a bagpiper. To finish, a dessert of Cranachan will be teamed with a ‘Cranachan Club’ cocktail of Dalmore 12 year-old, honey, lemon, raspberry syrup and a caramelised oatmeal rim. The menu with accompanying drinks is priced at £70 per-person, with one sitting from 19:00. Further information can be found at plumandspiltmilk.com. Our favourite high-end Indian restaurant, Benares in Mayfair will serve a tandoori haggis pie with cranberry and Darjeeling chutney to celebrate Burns Night. In addition, the dish created by Chef Patron Atul Kochhar can be accompanied by ‘The Bobby Burns’ cocktail, created in association with Chivas Regal. Featuring Chivas Regal 18 year-old, Amaretto Disaronno, lemon juice, orange juice, chocolate bitters and homemade whisky and cardamom syrup: the cocktail is then topped with a caramel basket, maraschino cherries and lemon and cardamom foam. Further information can be found at benaresrestaurant.com. Collaborating especially for Burns Night, Roy Brett Chef Patron of Ondine in Edinburgh will come to London and team-up with Nathan Outlaw this week. Taking place at Outlaw’s at The Capital, the Michelin-starred restaurant will showcase a five-course menu, plus optional whisky pairings, using the finest ingredients, seafood and Scottish produce. Courses will include seafood specialties such as oysters and langoustines, plus classic dishes such as haggis and mutton broth. Roy Brett’s appearance for this one-off experience will be his debut partnership with Outlaw’s at The Capital, and will see him in the kitchen on the night with both Head Chef Tom Brown and Nathan Outlaw. Further information can be found at capitalhotel.co.uk. Chelsea’s Rabbit and sister venue The Shed, in Notting Hill, will also be offering a special feast in honour of Robert Burns. Instead of following the stiff traditional route, however, both restaurants’ Burns Night specials will be a little different. Starters, for instance, include duck livers on griddle cakes, or smoked salmon, rye and rose geranium. Mains, on the other hand, consist of either neeps and tatties rosti with whisky ketchup, or lamb faggots with pumpkin spaghetti and artichoke ‘mud’, followed by a traditional deep-fried homemade Mars bar. Further information can be found at rabbit-restaurant.com or theshed-restaurant.com. A selection of haggis-inspired cocktails and free whisky drams will be on offer at Milroy’s, London’s oldest whisky shop, on Wednesday 25th January. A peppery take on the classic ‘Bobby Burns’ cocktail, the evening’s main cocktail is inspired by the spices used in Haggis, created by the downstairs bar’s expert bartenders, using a relative newcomer R&B Distillers’ Raasay While We Wait. What’s more, guests will also have the chance to preview a free sample of the second batch of R&B Distillers’ lightly peated single malt to toast the haggis. Further information can be found at shop.milroys.co.uk. 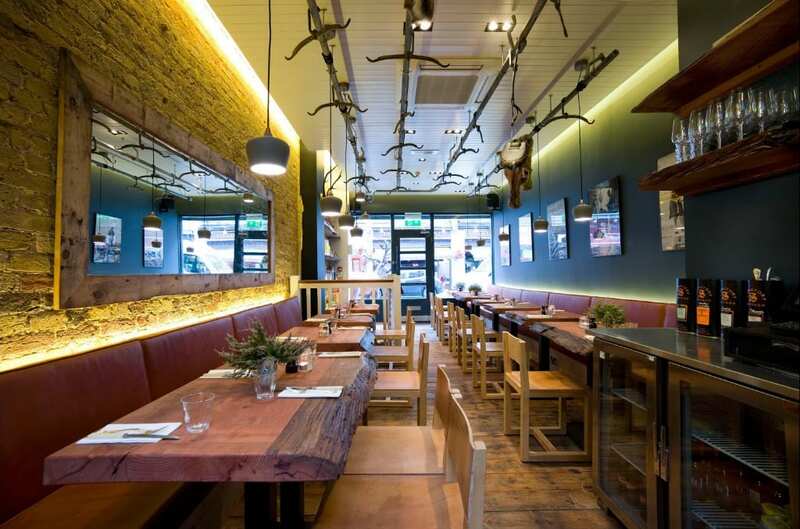 Alternatively, here’s a reminder of our roundup of London’s best Scottish restaurants.